Though there is currently little that is known about the embryonic development of the individual receptors of the somatosensory system, the earliest signs of these sensory components are of great interest. Stages from gestation through to embryonic periods of the development of the neural crest were examined. With most developmental activity occurring in the later periods of embryonic development- week 7-8, in relation to survival, innervations, derivatives, differentiation, genetic components and times of first appearance (through light microscopy) of these receptors. To grasp the significance of this system in human survival and progression through life it is important to consider where it all began. Providing an overview of what is currently known about the embryonic development and roots of the somatosensory system and the progression of current scientific and medical research can advance individuals understanding. Weber recognized for his role in the study of the nervous system including the establishment of the Weber’s law (Giclu, 2007). Some of the historical research conducted by Weber concerned the various aspects of nervous system including inhibition of impulse transmission, summation, adaptation and fusion. The shift from philosophy to physiology can be attributed to Weber’s research work through which he influenced the view on the human system. Other discoveries that followed Weber’s discoveries about the somatosensory system include the discovery that most receptor endings in the skin, the connection between the system and the spinal cord. The other important historical discovery about the somatosensory system include the discovery of different kinds of electrical potential in the nervous systems not covered by Weber as the pioneer in the understanding of the nervous system (Deco & Rolls, 2006). 1906 Charles Sherrington demonstrated that different types of stimulation on nerves led to different responses. Some nerves were found to activate when intense stimuli are applied, causing the sensation of pain. These receptors were given the name nociceptors. Sensory signals from the face are passed through the trigeminal nerve which passes signals to the trigeminal sensory nucleus. Axons from this trigeminal sensory nucleus go to the medial regions of the VP of the thalamus. From there fibres conduct the signals to the primary somatosensory cortex. VP afferents develop just prior to the development of the area of the somatosensory cortex that will process the information from these VP afferents. The VP afferents receiving information from the face and jaw differentiate before birth. Then the lateral regions of the somatosensory cortex develop. Within 24hrs after birth, the VP afferents receiving sensory information from the rest of the body develops. This will be followed by the development of the medial regions of the somatosensory cortex that processes the information from the body. Consequently, there’s a lateral to medial gradient of somatosensory cortex development which controlled by the VP afferents from the thalamus. This is the process where sensory afferents synapse the neurons in the spinal cord so peripheral somatosensory information can be transmitted through the spinal reflex arc or up to the primary somatosensory cortex where the information can be processed. Sensory afferents from the periphery, with their cell bodies (soma) in the dorsal root ganglion, grow towards the spinal cord in stages to make these connections with the CNS. The sense of touch allows individuals to perform a myriad of functions through the receptors deep within dermal and epidermal layers of the skin. This sensory modality, though its' development is not greatly understood among the five acknowledged sense subsets, it is essential for survival and development throughout life. Pacinian corpuscles, like other sensory receptors are derived by the dorsal root ganglia neurons of peripheral sensory axons. In embryonic development, these appear E 16.5 (embryonic day) in mice. In human embryology, this corresponds to day 58-59, which is satge 23 and week 8 (final week of embryonic development). In order for development, they require tyrosine kinase receptor (TrK) signaling and nerve growth factor (NGF) gene. Formation occurs in the dermis, hypodermis, the surfaces of muscle and tendons. Development is dependent on sensory innervations. Merkel cells are derivatives of the epidermis of the developing embryo. They are able to be seen, with short dendrites, as early as week 8 in embryonic development, within the stratum basale of the epidermis. 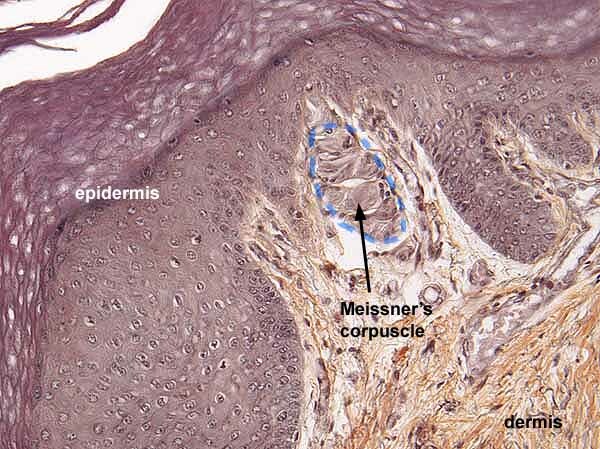 The four receptors of the skin that pertain specifically to pressure of the somatosensory system are Pacinian corpuscles, Meissner corpuscles, Merkel discs and Ruffini nerve endings. As seen in the table above, they are categorized into two subtypes, either slow or fast adapting, depending on whether pressure is applied to the skin at low or high frequency rates. In addition, pressure receptors influencing the function of major body organs (baroreceptors) will be discussed in reference to their similarities with the above mechanoreceptors of the somatosensory system. Slow adapting receptors respond to consistent pressure, meaning they continue to respond as long as the stimulus is in contact with the skin. Ruffini endings are encapsulated, slow adapting type II receptors that respond to consistent pressure. They are known to be innervated by A-beta fibres and to have large receptive fields similar to that of Pacinian Corpuscles. The pressure sensations detected by the Ruffini endings are therefore not very well localised. In addition, Ruffini endings are surrounded by collagen fibres, parallel to the skin and therefore are highly sensitive to stretch sensation. Rapidly adapting receptors only respond to changes in pressure, therefore, they respond when the stimulus first touches the skin and when it is removed. Pacinian corpuscle are comprised of nerve endings that are wrapped with layers of connecting tissue giving them an ‘onion like’ histological appearance. When this connective tissue that surrounds the nerve ending is deformed, it presses on the nerve endings, triggering an electrical impulse. The receptive fields of the Pacinian corpuscles are relatively large, so the region of sensory space that stimulates and evokes activity in the receptors is wide and therefore the sensations are not very well localised, resulting in low spatial resolution. All of these features determine the rate and extent of response to pressure, elicited via the Pacinian corpuscles. Meissner Corpuscles respond to transient and phasic pressures rather than constant pressure. Unlike Pacinian corpuscles however, their receptive field is small, so the sensations are well localised and specific. As a result of being superficially located in the glabious skin they are mainly within the extremities such as the palms and soles of feet. These corpuscles are innervated via myelinated fibres from the sub-epidermal nerve plexus that lose their myelination as they enter the corpuscle. The development of pressure receptors takes place during the gestation period with the rapidly adapting pressure receptors developing first then followed by the slow adapting pressure receptors. Although these pressure receptors are present throughout the fetal life to adulthood, their depolarization responses to chemical irritants, mechanical injury and inflammatory mediators are been found to be similar in both the fetus and adults. Baroreceptors are special pressure receptors found in the right atrium of the heart and play the role of detecting changes in blood pressure enabling the body to control the pressure and the amount of blood flowing into the heart. They are also quite abundant in the Aortic Arch, where they are innervated by the Aortic Nerve, a branch of the Vagus nerve, as well as in the Carotid Sinus, where the Nerve of Hearing from the Glossopharyngeal nerve innervates the receptors. Baroreceptors are similar to Ruffini nerve endings in the sense that they respond to stretch. Changes in pressure within the vessels affect the stretch of the wall, which in turn activates the baroreceptors which sending a signal conveying this change. Different studies have established urinary bladder mechanoreceptors are responsible for detecting changes in bladder volume or intravesical pressure. Such receptors are sensitive to the stretching of the wall. Meaning, as the bladder begins to fill, its walls stretch which, in turn activates the mechanoreceptors present that send a signal to the brain conveying the amount of pressure being exerted. Due to the limited understanding of the differentiation and development of the above mechanoreceptors, current literature is aimed at the transcription factors and genes that code for these particular receptors within the skin. Two genes that have been considered in recent findings are c-Maf transcription factor and Shox2. Nociceptors develop throughout embryonic, fetal and postnatal periods. The table below is a summary of nociceptor development. E stands for embryonic day while P stands for postnatal day. In nociceptors, as well as other small diameter neurons, neuropeptides such as substance P (SP) and calcitonin gene-related peptide CGRP, are expressed. Expression of these neuropeptides that characterize nociceptors, are controlled by both intrinsic and extrinsic cues. These neuropeptides SP and CGRP rise as early as embryonic day 14.5 in mouse – at this stage nociceptors have not made contact with their target tissues. Thus nociceptors do not require contact with peripheral target tissues to express some levels of SP and CGRP. However, studies also show that number of CGRP expressing nociceptors increased under the influence of epidermal cells. Thus extrinsic cues, through the contact with target tissues, enhance the development of the chemical phenotype of nociceptors. In addition to sensory modalities such as pressure and pain, the human body is able to detect the temperature of its surrounding environment. This is called thermoreception, and is extremely important for a variety of reasons. The ability to sense temperature is important for maintaining homeostasis in many biological processes. It is also of practical safety use, we are able to reliably avoid stimuli that are either too hot or too cold and may do us harm. The sensation of temperature is made through free nerve endings in the epidermis of the skin. These free nerve endings contain specialised ion channels called temperature activated transient receptor potential ion channels. We will refer to them as ThermoTRP’s. These receptors are able to generate action potentials in response to changes in temperatures in the environment surrounding the nerve ending in the skin. The nerve impulse generated by these receptors is conveyed along the nerve fibre and into the dorsal root ganglion. There are two main types of ThermoTRP, those that are activated by warm stimuli and those that are activated by cold stimuli. There are four main ThermoTRP receptors responsible for the perception of warm stimuli, both innocuous and noxious. They are called TRPV1, TRPV2, TRPV3, and TRPV4. Each receptor is unresponsive to mechanical stimuli, but can be excited by some chemicals such as capsaicin in the chili plant. The firing of each receptor is inhibited by falling temperatures. TRPV1. This receptor is responsible by the sensation of mild heat. The receptor is activated by temperatures over 30 ˚C. As temperature rises the rate of nerve impulses also increases, reaching a maximum rate at 42 ˚C. Either side of 42 ˚C, the firing rate of the nerve decreases, forming a bell shaped curve. This means that the firing rate of the receptor conveys information relating to the environments temperature back to the central nervous system. It can be appreciated that thermosensation becomes ambiguous when using the bell shaped curve representing action potential rate plotted against temperature. Two temperatures will have the same action potential firing rate. This is overcome by the presence of the cold receptors. The firing rates of both the cold and warm receptors are "read" by the body to determine the environmental temperature. TRPV2. This receptor only fires an action potential when in contact with temperatures sufficient to cause harm .This is generally temperatures over 52 ˚C  . TRPV3. Activated strongly by temperatures in the 34-38 ˚C range. TRPV4. Activated at 27 – 34 ˚C. Cold thermoreceptors essentially work in an identical manner to warm thermoreceptors. Instead of being activating by rising temperatures, they are stimulated by falling temperatures. There are two main receptors responsible for perception of cold stimuli. TRPM8. This receptor is responsible for the perception of innocuous cold temperatures, that is, temperatures that will not cause the body harm. They are activated when the temperature of the environment surrounding the nerve ending falls to between 25 and 28 ˚C. As seen with the TRPV1 receptor, the stimulation of TRPM8 by a range of temperatures produces a bell shaped curve with a maximum firing rate seen around 25-26 ˚C.  .
ANKTM1. Noxious or damaging cold temperatures are those at or below the 17 ˚C mark. These extreme temperatures are able to activate the ANKTM1 receptor. The development of thermosensation, like all senses, is intimately tied to the dorsal root ganglion (DRG). The neurons that project into the skin to house the thermoTRP channels also pass through the DRG where they synapse and the information is carried into the central nervous system. The actual expression of thermoTRP channels, the functional unit of thermosensation, occurs quite late. TRPM8, the receptor for cold and menthol stimuli, is first seen in the mouse embryo at day 16.5 post conception . This corresponds to a stage 23 human embryo in the 58th day of gestation; this is also the last stage of embryonic development. There are many genes and proteins that control the development of the dorsal root ganglion and sensory peripheral nerves; the following is a summary of the most important. Please be advised that all research into these genes have been done of either rats or mice and may not correlate exactly to the human embryo. One of the earliest markers of the thermosensory neurons is their expression of TrkA, a nerve growth factor receptor . The actual expression of TrKA is dependent on two other proteins, Neurog 1 and Neurog 2 . The TrkA lineage neurons are an important source of sensory nerves. Approximately half of them continue to express TrkA during development, the other half ceasing TrkA expression and beginning to produce RET. These RET+ neurons are important as it is from them that the thermosensory nerves are derived . This switching is not complete at birth, only finishing at postnatal day 30 . RET is an important receptor for glial-cell-derived neurotrophic factor . It is in these neurons that another important protein is present called Runx1. Runx1 is a runt domain protein. These proteins are involved in mediating many developmental processes . The role of Runx1 in controlling the development of the thermoTRP channels used in thermosensation can be observed by breeding Runx1 deficient mice. These mice do not express TRPM8, and the expression of heat sensors TRPV1 and TRPV2 is very deficient . A more broadly acting protein, but just as important as those already mentioned, is Brn3a. This is a protein that is involved in the differentiation of neurons into peripheral sensory neurons . It is an example of a homeodomain proteins, that is, it controls the transcription of a range of genes. When Brn3a is deficient, the axonal growth of the sensory neurons is impaired and they also go through apoptosis at a more rapid rate . This means that Brn3a is important for the migration of thermosensory neurons into their destination in the skin. This table shows diseases that can affect the development of the somatosensory development. These abnormalities are not diseases of the somatosensory system specifically but they do affect the development of the somatosensory cortex or the peripheral touch receptors. Used for describing if a nerve, receptor or cell is affecting or associating with skin. A stimulus that poses no threat of harming the tissues and structures of the body. A stimulus that me be toxic to the tissues of the human body. An example of this would be the extremely hot temperatures of a fire, which are perceived as noxious by thermorecepters in the skin. an area of the body surface over which a single sensory receptor, or its afferent nerve fiber, is capable of sensing stimuli. Primary glia, non-neuronal cells. Supporting homeostasis in the body, neuron growth and formation of myelin. This page was last modified on 5 October 2012, at 18:30.